This soccer fitness drill will focus on dribbling with speed while getting in fitness at the same time. Split the team into groups of 4. Two players from each team starts on each sideline. Each group of 4 will need 1 ball. 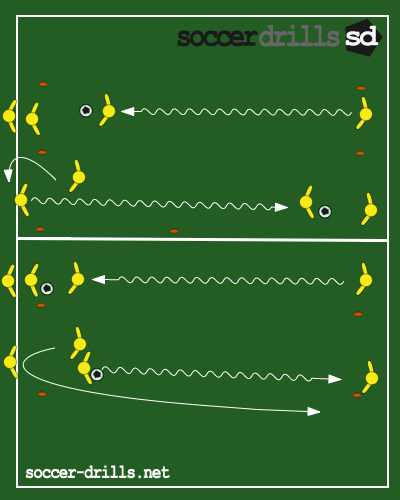 The player with the ball dribbles with speed across the field to their other players in their group. The players should make a smooth exchange with the first player in line and dribbles with speed across the field again to their teammates. The play continues until each player has made 10 trips across the field. The ball should be touched in stride while making long strides using the top of the foot near the toe. Don't let the ball get too close or too far from the dribbling player.